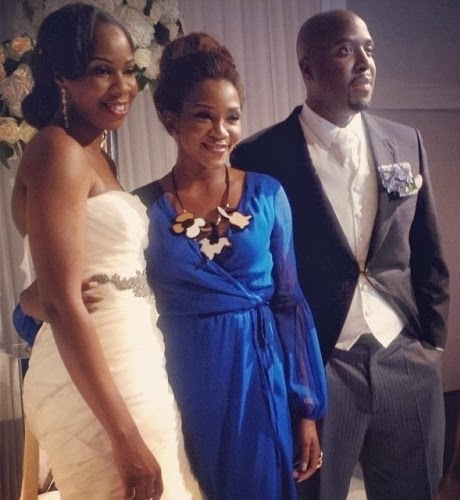 Nollywood actress Genevieve Nnaji was among the top celebrities who travelled to London this past weekend to grace the white wedding ceremony of Nigeria’s top PR guru, Vanessa Amadi. On Saturday the 28th of September, Vanessa and her long time lover married in style in the UK. The mother of one said Vanessa Amadi is one of the most selfless woman she has ever come across. “…She is definitely one of the most amazing, selfless people I know.” – said Genevieve who stormed the wedding in blue long sleeve satin dress. Also present at Vanessa Amadi’s wedding ceremony were radio personality Tolu Oniru aka Toolz , Designer of world’s most expensive champagne, Alexander Amosu and star singer D’Banj. 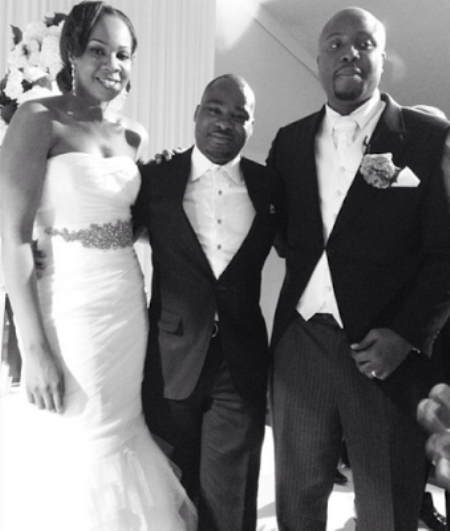 Alexander Amosu with the newly married couple. Congrats to Vanessa and her hubby. I adore this woman. She looks good in everything she wears. genevieve..when is urs coming..from china to canada.criss crossing the globe..